After exiting through exit no. 4, walk straight and make a left at the gas station and take the no. 2 Town Bus in front of the bakery. Get off at Dormitory cross-road stop (Kisooksa samgeori stattion) and the walk towards the Graduate School of Environmental Studies (Bldg. 82). Walk until you fine the GSPH building (Bldg. 221) and follow it. That'll be about 15 minutes. After exiting exit no.3, walk towards the Gwanak-gu Office. There you will find a bus number 5511 that comes to SNU. The interval of the bus is usually in the range of every 10 minutes. 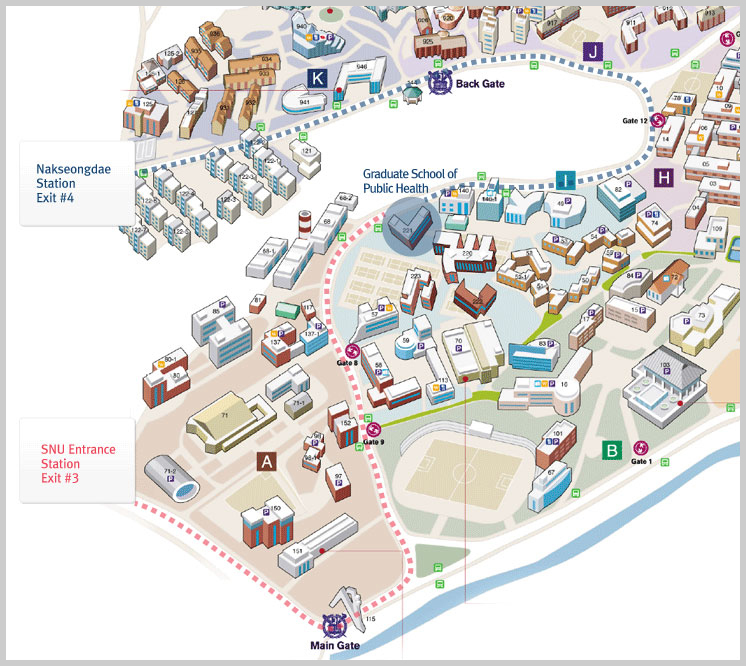 You will get off at school of veterinary medicine stop, and then you can find GSPH building (Bldg. 221). Building 221, 1 Gwanak-ro, Gwanak-gu, Seoul, Korea 151-742.